If you follow me on Instagram (thanks for helping me hit 2000! ), then you probably saw my snap of my birthday party invitations. Hands down the question I get asked the most about my blog is who designed my website... I actually designed it myself because I have this secret love for graphic designing. Although I don't think I would pursue a career in it (I'm not that good), I'm creative and capable enough to tickle my own fancy every once in a while. Pasting this image into Photoshop where I was able to size the white space around the monogram and add a border. Copy and paste this image into Microsoft Word where I added the text and break line. It was a super easy process; I hope this gives you a little inspiration to play around and get creative with your graphic design skills! I'm so impressed you did that yourself! I use microsoft word for a lot of basic designing stuff, but I was supposed to learn photoshop this summer and never got around to it! If you love graphic design definitely pursue it because you are really good! Uhhh can I hire you for my 21st? Is that a thing? I don't think bar invites are a thing but incase I do a brunch Iknow who I'm coming to! Wow that is insane that you did those yourself! They are stunning, I would totally buy these! And how exciting, I hope you have a great birthday. These are so cute Fran! Love it! These are beautiful Fran! I can't believe you did them yourself! Gorgeous cards! Love the clean look of them! You certainly know what you're doing! Designing your website by yourself is no easy feat. Your background graphic design certainly helps, though. I like how you came up with your logo by availing of free web services in order to make it. This lessens the costs significantly. You're also into social media, so that also helps in getting some publicity for your website. Every little bit helps! Thanks for sharing! I believe you should pursue your career in graphic design, Frannie. 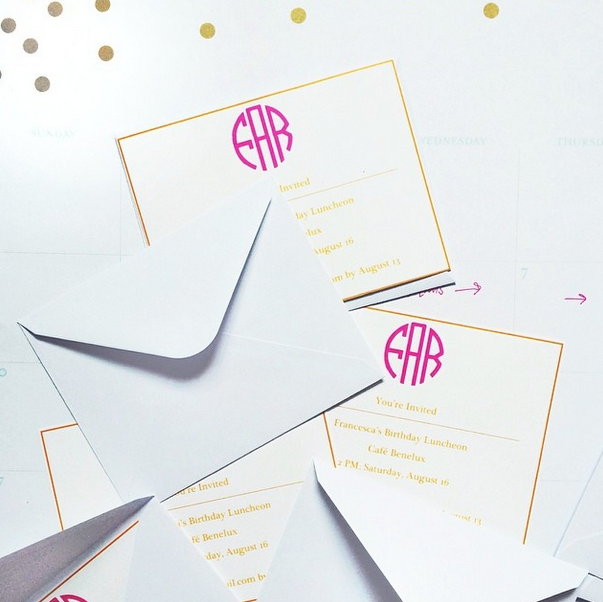 Those invitations look fabulous! Your clients must be looking forward to seeing more of your artistic crafts and purchase them for their occasions. You could focus on web design first or printing invitations or cards. If you’re satisfied with the result, you can work full-time on both. Have a great day!